We were startled when the Vatican authorities admitted that Michelangelo’s Sistine Chapel frescoes are in greater peril than at any point in their history. Powerful art institutions rarely broadcast their own embarrassments. More often, they see off their critics by sitting tight, quietly briefing journalistic proxies and…continuing to be. Welcome as was the acknowledgement of the problem by Antonio Paolucci, director of the Vatican Museums, casting the Chapel’s paying visitors as the principal cause of the present crisis, masked greater institutional responsibilities. The Vatican has yet to acknowledge that this environmental crisis arose as a direct consequence – and within just two decades – of permitting the Chapel’s ancient frescoes to be used as a test bed for the then new and highly controversial cleaning agent “Mixture AB 57”. And, despite the brouhaha over toxic visitors, there remains no hint of acknowledgement that the restorations of the 1980s and early 1990s proceeded on an art critical misreading which, in addition to stripping the fresco surfaces bare and leaving a chemical time-bomb within the Chapel, inflicted grave and irreversible artistic injuries on Michelangelo’s paintings – see right. 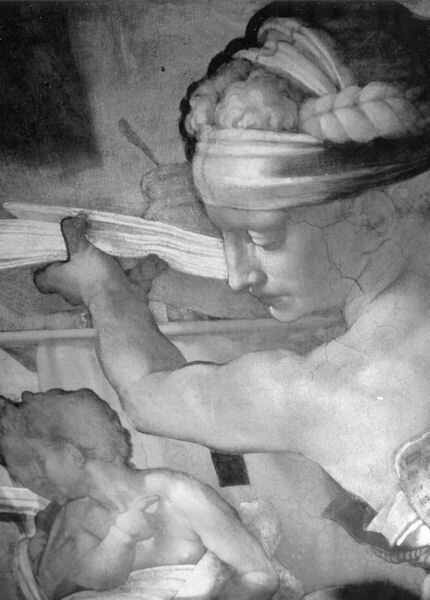 On the cleaning method’s toxic conservation legacy, we had precisely warned in 1993 that: “even if the Vatican team were to concede that the brilliance of Michelangelo’s new colours is a chemical deceit purchased at the cost of a physical and chemical weakening of the frescoes, the dispute would not be laid to rest. The need to avoid further deterioration would still be there.” (James Beck and Michael Daley, “Art Restoration: The Culture, the Business and the Scandal”, Chapters III and IV.) In similar vein we can now say that today’s promises of dramatic technical “improvements” are simply recycled 1980s assurances that, at best, remain of a palliative nature. Even when promised the first time around, the Vatican authorities had admitted to us (see below) that the measures could not fully solve the then already pressing environmental problems unleashed by the restoration’s experimental method. AB 57 was developed by Professor Paulo Mora and his wife Laura Mora, chief conservators at Rome’s Istituto Centrale del Restauro, for cleaning stone buildings. It comprised: “a mixed gelatinous solvent, consisting of a solution of ammonium bicarbonate, sodium bicarbonate, Desogen (a surf-actant and anti-fungal agent), carboxymethylcellulose (a thixotropic agent), dissolved in distilled water.” Toti Scialoja, a painter and a former professor at Rome’s Academy of Fine Arts, complained that its ingredients were “too powerful – ammonia and soda, the stuff you use to clean your bathtub”. Professor Christoph Frommel, director of the Bibliotheca Hertziana in Rome, described it as “a sharp and aggressive chemical”. 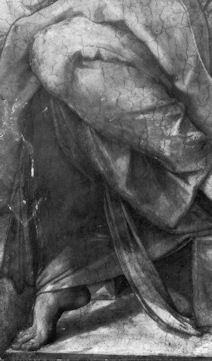 Even though no evidence was ever produced of extensive glue applications having been made by restorers, in the early years, art historians and credulous art critics queued to repudiate what one scholar dubbed the “Darkness Fallacy” and the “Sculptural Fallacy” of traditional Michelangelo studies. The proclaimed “New Michelangelo”, however, was an entirely modern chemically engineered artefact, not a scholarly construct. In fact, it flew in the face of the historical record: Michelangelo had been celebrated at his own funeral not for any colouristic brilliance – let alone for, as one critic recently held, the “sharp and acid palette used by Michelangelo in the Sistine Chapel” – but for his “fleeting, sombre colours”. The new art historical dispensation rested on a twentieth century purging of aged, sometimes distressed but nonetheless authentic material. Indeed, it was precisely because this was not a historically-informed recovery of an original state that drums had had to be rolled for “The New Michelangelo”. It was claimed that this revisionist reading of historical and material evidence had been corroborated “scientifically”. But this was a New Science to sanction a New Michelangelo. 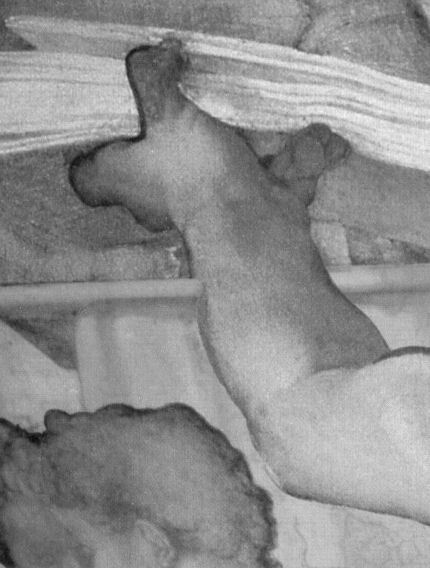 Scientific examinations of the frescoes in the 1930s by X-ray and ultra-violet imaging techniques had led to altogether contrary conclusions. It was reported in 1938 that Michelangelo’s “overpaintings were lying quite brightly a secco on the fresco layer itself; these overpaintings proved themselves undoubtedly the painting of the Master himself.” (See “Art Restoration”, Chapter III.) It was further claimed that Colalucci and his colleagues had recovered the original fresco surfaces so deftly that they had preserved its “original” patina and even left a thin layer of dirt above them that would protect the new surface from airborne pollution. Well, we all now know from the present panic in the Vatican that that assurance was not worth a used solvent swab and that a couple of years ago “unimaginable amounts” of dirt were scrubbed off the frescoes by conservators working at night so as not to impede the daytime tourism stream. Conservation science has its uses but it can never analyse or appraise works of art because Art’s essential properties are aesthetic not material; perceptual not mechanical. Insofar as there might be a science of art, it is to be found in art itself and within artists’ own practices. This is because art consists not so much of materials as of values and the relationships between values that artists’ create and orchestrate, albeit, with materials. These values are aesthetically relative, not intrinsic to materials, and they are continuously appraised and adjusted by artists as they work. Self-criticism, self-analysis and continuous aesthetic appraisal are integral to the making of art. With art, critical and analytical faculties can never be replaced by apparatuses or be donned by technicians. Conservation science might sometimes tell us of what something is made but never by whom it was made. In terms of professional art restoration, conservation science can serve a useful diversionary purpose. The restoration-authorising authorities and art lovers alike can be invited to put aside critical responses on an implicit assurance that some inscrutable but infallible force has guaranteed the probity of whichever of the many conflicting restoration methodologies is being used at that moment. We ArtWatchers are not inclined to be so trusting nor so easily led. 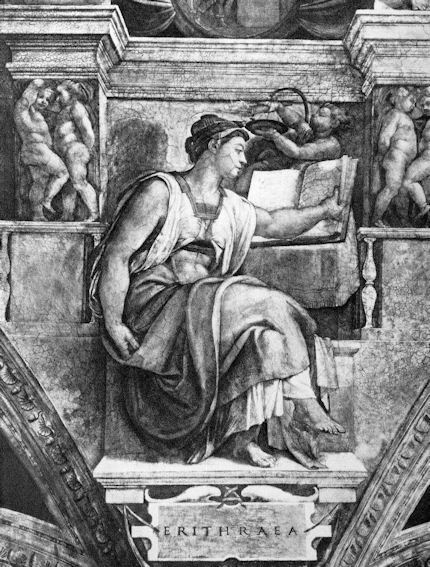 In the case of Michelangelo’s Sistine Chapel ceiling, having examined evidence of the cleaning method and its consequences for two and a half decades, and being now armed with the officially published accounts, we are confident that not only can it be shown that Michelangelo’s tonal/plastic systems were recently injured, but that even his very designs, his drawing, his vaunted disegno were repeatedly violated and corrupted. These losses and violations were not so much unfortunate by-products of an inappropriately aggressive cleaning agent as the consequence of prior and catastrophic failures of art critical judgement and powers of aesthetic analysis. This failure was evident not only within the Vatican’s curatorial, scientific and conservation staffs, but throughout much of the wider international art historical establishment. By effectively agreeing to “de-attribute” what were – and had always been recognised to be – the last stages of Michelangelo’s own work, an overly deferential art historical establishment sanctioned their destruction. For all this (initial) pan-national consensus, the judgement was historically rogue. In 1986, when defending his own restoration, the chief restorer, Gianluigi Colalucci admitted that his professional predecessors’ judgements had been contrary to his own and “not encouraging” to the restoration. That was an understatement: restorers who had worked on the previous restoration (1935-36) had officially and flatly reported that Michelangelo had “finished off a secco”, that is, that he had painted on top of his frescoes when they had dried. For Wilson, there could “be no doubt that nearly all of this work is contemporary, and in only one part was there evidence of a later and incompetent hand.” Aside from its artistic force, certainty about the secco painting’s antiquity lay in an elegant technical proof: “The size colour has cracked as the plaster has cracked”. It is a matter of record that the ceiling cracked before any restorers touched it. If, as has been claimed, later restorers had repeatedly applied glues, those glues would inevitably have been brushed into the pre-existing cracks. Wilson, who tested the depth of the cracks with a penknife, saw that none had been. Artists like Wilson appreciate that it is impossible to paint over a cracked surface without working the material into the cracks. Wilson was left in no doubt: having been applied when the ceiling was new and not-yet-cracked, these surface glue paints could only have been Michelangelo’s own work, his finishing stages, his l’ultima mano. Normally, restorers recognise that when varnishes or paints can be shown to have run into age-cracked materials this can be taken as a proof of their more recent origins. On this occasion, the restorers failed to recognise the implications of the converse. Moreover, this original secco work, Wilson appreciated, was water-sensitive, having been damaged when “washed by labouring men with water in which a caustic has been mixed”. As to when the alleged restorers’ glue-varnishes might plausibly have been applied, no evidence was forthcoming. In 1996 Colalucci said that although “countless attempts at cleaning and restoration seem to have been made”, only “four are actually accounted for”. The four are of 1566, 1824-25, 1904 and 1935-36. As we showed in our post of 1 April 2011, that first restoration itself provided the clearest possible evidence of Michelangelo having painted shadows a secco. That evidence, taken together with the copies of the ceiling discussed opposite should have been an end to the matter. The last two restorations cited by Colalucci coincide with photographic records and these, too, offer no support for the claimed superimpositions of secco painting and glue-varnishes by restorers. Perplexed by the Vatican’s unwavering but evidently unsupported insistence that the ceiling had repeatedly been coated with glue “varnishes”, I asked in May 1990: “Does any documentary evidence exist to support the claim that hot animal glue was repeatedly applied to the frescoes over the centuries in order to revive the colours?” Colalucci replied that there was none. In 1986 he had reported a note in a manuscript which described how the ceiling had once been cleaned with linen rags and bread “scrubbing hard, and sometimes when the dirt was more tenacious, the bread was moistened a little” but added “That is as much as it says. The note does not mention at all the use of substances to revive colours or of glue varnish.” (See “Art Restoration”, pp. 74-78.) If, as Wilson discovered, the secco painting dissolved at the touch of a wet finger, an earlier hard scrubbing with wet rags or bread would certainly have been sufficient to cause the injuries that Wilson and others had reported to parts of the ceiling. Wilson’s appraisal was echoed from another scaffold a century later. In 1967 the art critic and writer Alexander Eliot and his wife Jane Winslow Eliot spent over 500 hours making a close-up documentary film of the ceiling, “The Secret of Michelangelo, Every Man’s Dream”. Alexander Eliot reported in the April 1987 Harvard Review how “with the exception of the previously restored Prophet Zachariah, almost everything we saw on the barrel vault clearly came from Michelangelo’s own inspired hand. There are passages of the finest, most delicately incisive draughtsmanship imaginable. 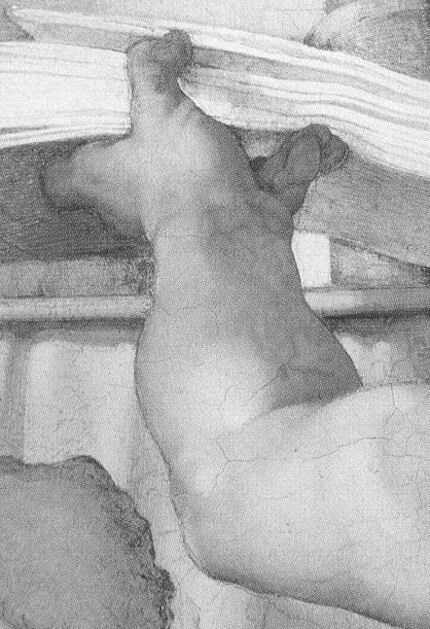 Michelangelo’s loving depiction of fingernails, eyelids and tiny wrinkles stand in contrast to tremendous swirls of colour…” On 20 May 1985 Eliot had pleaded with the Vatican’s Secretary of State for him to view the Vatican’s own copy of the Eliots’ film and to “have it stopped at the images of the Ancestors [on the lunettes]. Compare what it proves was there against what’s left today”. That precious, now historical, record still awaits a re-showing. In 1989 the sculptor Venanzo Crocetti, who had spent “four full years” working during the 1930s as an apprentice restorer on the scaffold, published three photo-comparisons of the cleaned lunettes in an article in the December Oggi e Domani (“Salviamo Almeno il Giudizio Universale”) – see Fig. 28. Crocetti’s account was detailed and technically informed. He began by explaining how he had appealed unavailingly in 1983 to the director general of the Vatican Museums, Prof. Carlo Pietrangeli, to desist from incurring the “rapid biological degradation caused by the cleaning power” of AB 57. Crocetti flatly dismissed claims that the glues had been applied by restorers. He also testified that as early as 1983 applications of AB 57 had been standardised at 3 minutes each, regardless of local conditions (see below). He complained of the folly of cleaning aggressively in small patches, zones that had originally been made with very broad applications. These glue-paint applications, he noted, had been made chiefly in the shaded parts of the figures and to such artistically selective purpose that Michelangelo’s authorship was beyond question. As a (formerly) supreme case in point, see Fig. 1. Crocetti’s testimony on the AB 57 cleaning method then being used on Michelangelo was particularly damning. He noted that while the first 3 minutes long application left the frescoes looking cleaner, the second on the following day, left them with altered and considerably degraded colours. He believed that the first applications effectively “degreased” the surfaces leaving them open to greater penetration by the second applications. He was convinced that the immediately apparent visual effects of these twin applications would not be their final outcome. He argued that their corrosive actions would continue because of the absorption of the solvents to a depth of half a centimetre. Some days after the second applications he noticed (from the scaffold itself) the appearance of “whitish oxidations of variable intensity” over large zones. He considered the restorers’ claimed discovery of “stratifications of dirt gathered on the frescoes over the centuries” exaggerated and misleading, and he held that the early photographs of the lunettes by Anderson made the extent of this exaggeration clear – see Fig. 28. He believed that the ferocity of AB 57 made any finely tuned cleaning gradated to meet local conditions impossible. He believed that the greatest injury was to the chief feature of the frescoes – their disposition of lights and shades, and not their local colours. He believed that the restorers, in their pursuit of more intense colours, had penetrated the frescoes to their brighter, less modulated preparative layers. He felt confident that he had seen at first-hand how, with “cleaning”, the figures in the lunettes had been remade, becoming “false in form and colour” alike. He saw that many of the shadows from which the figures had formerly emerged had simply disappeared. He saw that corrections which Michelangelo had, with mastery, made invisible, had been exposed (in particular, see Figs. 11-16). Above all, he confirmed that the condition of the frescoes remained “excellent”, and that this was in part due to the absorption over the centuries of greasy substances of chapel smoke which had “strengthened the colour. Leaving upon it a glittering shift of the lightest varnish [thereby counterbalancing] the aridity and fragility” of old fresco. Having worked on the restoration in the 1930s, he found himself near to despair. AB 57, a calcium dissolving solvent, was thus used to remove organic materials with an oven-cleaner like ferocity and speed even though many experts held those very materials to comprise authentic Michelangelo work. Contrary to assurances otherwise, the aesthetic consequences of this stripping extended, as Crocetti had observed at first hand, into the very fabric of the exposed fresco surfaces. This was a serious matter. The Vatican’s research chemist, Nazzareno Gabrielli had explained that AB 57 contained two separate salts because while “Ammonium Carbonate alone tends to tone down colours…sodium carbonate livens them up”. The Moras’ combination, he judged, had “the proper chromatic effect”. So far as we know, it was never explained by what means the “proper” combination for Michelangelo might have been established. Juggling with dangerous chemicals and processes constitutes professional chic in some restoration quarters. Restorers often claim that a dangerous chemical in “safe hands” is better than a mild one in “untrained hands”. When restorers speak among themselves, the professional conceits are more evident. The IIC Bulletin carried an obituary on Paolo Mora who died on 27 March 1998. He had studied under Mauro Pelliccioli, who restored Leonardo’s Last Supper, and, reportedly, was fond of claiming that he could clean a picture with a broom and drugstore chemicals. When he found himself too busy to clean a large Bellini altarpiece, Pelliccioli enlisted two students and showed them how to dissolve rods of caustic soda in water. He demonstrated his cleaning technique by sweeping a swab of soda over the picture with one hand followed immediately by a “neutralising” swipe with a turpentine swab with the other. Thus enlightened, the students were said to have “cleaned the large painting in a single day”. Aside from exposing the stripped fresco surfaces to the Chapel’s notoriously polluted atmosphere, yet other risks were taken in pursuit of brighter colours. Removing the water-based solvent gel with copious amounts of washing risked, as Frommel feared and Crocetti had observed, depositing corrosive ingredients within the frescoes. The “highly soluble” ingredients were said to have been selected because “they are easy to wash off”. It was certainly desirable that they should be so: carboxymethyl cellulose is known to encourage sodium retention; ‘Desogen’, being a detergent as well as fungicide, is non-volatile and does not evaporate. The Moras had conceded that these ingredients have “the disadvantage of remaining in the painting unless removed after treatment by rinsing with water”. There are problems with washing, however. First, the rinse water was absorbed deeply into the porous fresco and with it, inevitably, particles of soluble and corrosive ingredients. Twenty four hours were needed for the water to evaporate before a second application of AB 57 could be applied. Second, tap water may contain solutions of sodium, iron, copper, and chloride, and unless it is packed with sufficient calcium bicarbonate, will itself attack the calcium carbonate of fresco. Even distilled water (which is free of impurities) slowly dissolves calcium carbonate and attacks the frescoes’ structure. When challenged in 1991 on having introduced dangerous materials into the frescoes, Colalucci replied: “AB 57…has been greatly tested and is very old. The actual solvent is held within a gel which does not allow the particles of the actual solvent to penetrate the plaster and the colour. However, the gel is removed and only a minimal (if any) percentage might remain which has no influence on the colours.” In 1986 Colalucci disclosed that, at that date “The work was concluded with abundant rinsing, repeated at intervals of up to several months” and that only “The last rinsing was done with distilled water”. Much copious washing was thus carried out with tap water. Far from having “no influence”, experts expressly feared that residues deposited within the frescoes by rinsing would react with airborne pollutants and moisture. The restorer Mirella Simonetti held one of AB57’s ingredients, bicarbonate of soda, to be an “extremely damaging” residue because, when combined with the sulphates of calcium and air-borne sulphuric anhydrites, it produces sodium sulphate – a whitish dust which corrodes the fresco and destroys its coloured surface. Simonetti also maintained that the use of EDTA (ethylene diamine tetra acetic acid) within the solvent gel had chemically altered the fresco by causing a “breakdown in the molecular structure [and] bringing about a disintegration [which] in turn causes the division of the components and the discohesion of the lime.” Once weakened in this fashion, the disintegration would continue – and “even water can favour such a process”. Simonetti’s alarm was later vindicated when, tests showed that the compound’s corrosive properties etched the surface of marble into irregular corrugations, scattering light and imparting a deceiving effect of brightness that provided more routes of ingress to airborne pollutants. It had long been recognised that air-borne sulphur attacks fresco. In 1884 the reverend J. A. Rivington explained in a paper delivered at the Society of Arts in London how air contaminated by coal and gas emissions destroys fresco: “The carbonate of lime is converted into the sulphate, breaking up the paint and becoming itself disintegrated in the process of change.” The notoriously contaminated air surrounding and invading the Sistine chapel contains sulphur dioxide from coal-burning, nitrous oxides from car exhausts and hydrogen chloride from incinerated plastics. When combined with rain or condensed water these substances produce sulphuric, nitric and hydrochloric acids respectively, all fiercely corrosive. Water is brought into the Chapel by tourists in the form of perspiration and breathing vapour while breathing itself gives off carbon dioxide. In 1981 Colalucci had equated the glue/size paints with “extraneous chemical substances” without which “and with the science we have today” he hoped “the frescoes will remain in good condition for a very long time”. As mentioned, he offered an assurance that he had left “a very thin film of dirt touching the paint surface with its varying ‘patina’. This fine layer of dirt acts as a form of protection to the paint.” As also mentioned, we now know that whatever Colalucci might have left behind performed no such service, and that dirt on frescoes is no protection from further accumulations of corrosive dirt. Synthetic Resins – On or Off? Talley Jr. reported that Colalucci had assured him that Michelangelo had used no secco paint on the lunettes, and that while the synthetic resin B 72 had been used to seal the walls of the lunettes it had not been used to that purpose on the ceiling. Even the official apologias for B 72 were more disturbing than reassuring: “Like all restoration materials it has its good and its bad points”, Talley said. Frommel was quoted as saying “According to the critics B 72 is something which may become opaque in the future. Are the critics right when they say we don’t know what it will do? They say tests should have been made and then a long period of time should have been allowed to elapse before proceeding. Paraloid can close the surface to respiration. It can close the pores, and if that were to happen it might change the interior life of the fresco.” To this Talley gave voice to B 72’s champions. According to the Moras “If you don’t use Paraloid, what do you use? Organic resins and inorganic fixatives such as lime water, ethysilicates and barium hydroxide all have serious drawbacks. Of the synthetic resins the acrylics are the best, and of the acrylics Paraloid is the least bad.” Was the least bad, good enough for Michelangelo – and better than his own secco painting which had for centuries protected the fresco surfaces from airborne pollutants? On this question, the Vatican’s accounts prove unsatisfactory and shifting. All that can be said safely is that B 72 was abandoned and not replaced at some point between 1986 and 1991, at which latter date Colaucci claimed “There was no final application to protect or saturate the painting”. This change of mind was defended in 1991: “Our decision not to apply a protective material derived from the awareness that any new material which is not homogeneous with the original components of the fresco will undergo rapid degradation, causing, in the best of cases, aesthetic damage.” This being so, we must expect some parts of the frescoes to deteriorate more rapidly than others – but how many? In 1991 Colaucci put B 72 applications at “lunettes 50 per cent, ceiling 3 per cent”. 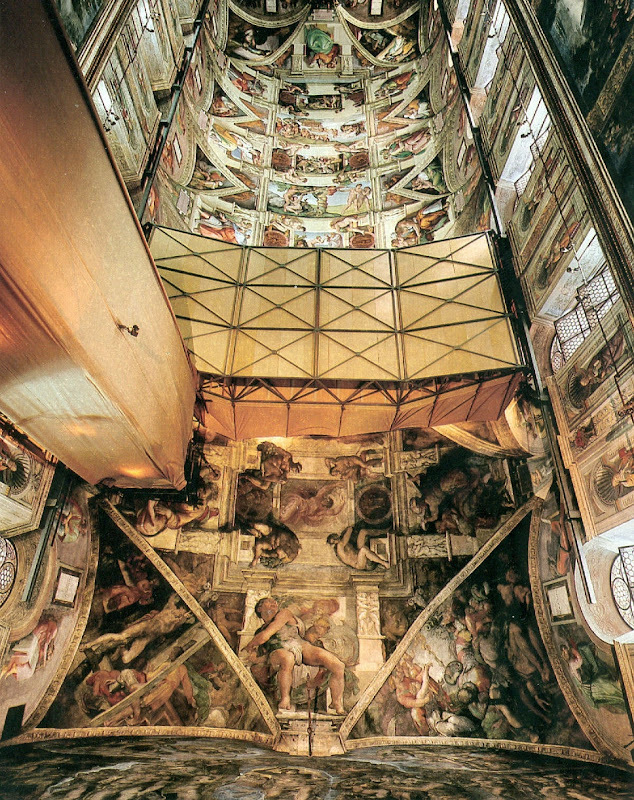 In 1993 (“Art Restoration” p. 120) we had noted that while protection of the frescoes was to depend on the thin layer of original dirt that Colalucci claimed to have left in place and on the above described plans to stabilise and purify the chapel’s microclimate: “When Michael Daley asked if the air-conditioning system would eliminate the great fluctuations triggered by tourists, he [Mancinelli] replied ‘No. It will reduce the peaks and the troughs but will not eliminate the problem entirely.’” Of course, at that date, as today, the problems could have been halved by halving the numbers of tourists. Then, as perhaps still is the case, on days when the Chapel was closed to visitors, visitor numbers to the Vatican museums fell by 60 per cent. “Within four years, Colalucci had abandoned this control of the solvent by constant observation and timing. In its place a standardized procedure was adopted, described in the 1986 ‘General Report on the Lunettes’: ‘First application, three minutes followed by removal and washing with water. Left to dry for 24 hours. Second application, three minutes followed by washing and leaving to dry as before’. These three-minute applications were said to have been ‘rigorously measured’. Colalucci explained the reason for the change of procedure: the size of the ceiling required that work be carried out by a team. Individual restorers, responding to the evidence of their own eyes, would draw different conclusions. Therefore, in order to obtain a ‘homogeneity of result’ – a ‘primary objective’ – they must be denied the opportunity to judge for themselves how long the solvent should remain in place. Solvent applications had to be predetermined, Colalucci felt, in order to avoid ‘either emotional involvement or complex mechanical manipulation on the part of the restorers’. When asked in 1985 at the Wethersfield Conference in New York why he did not adjust the timing to what his eyes were witnessing, he replied: ‘Because emotional or subjective conditions must not be permitted to intrude upon science.’ The scaffold, he added, did not permit stepping back to assess effects and the continuous bright lights of the Japanese film-makers ‘fatigued one’s eyes’. The activity of the film crews was itself a distraction as was also his having to entertain up to sixteen VIP visitors a day…” See Figs. 34 and 35. By test-driving a new cleaning agent under television studio conditions in a constricted, over-crowded and art-politically febrile space, the Vatican restorers pioneered a new professional genre: conservation as both entertainment and professional swank. The combination of the Nippon Television Corporation sponsored showbiz and a provocatively radical restoration drew many protests. This spawned intensely propagandistic promotional razzmatazz, the unprecedented scale and character of which will be examined in Part III. “The activity of restoration can be defined in terms of two overlapping headings, procedure and method. Procedure is fixed and invariable, and consists in the scientific planning and execution of the restoration project, regardless of the material involved. Method, however, is the department strictly of the action taken in the course of the restoration, and is therefore variable, subject to factors arising from the material, technique and state of conservation of the monument involved. “The adoption of a procedure which governs the progress of the work is characteristic of modern restoration. Under the impetus of a marked development in technological expertise, modern restoration has extended its established and primary function of conservation for aesthetic ends to include a research capacity, directed towards the work of art considered as an inseparable duality, conceptual and material. “In the past restoration practice aimed at cancelling out the effects of time and events upon the work of art, termed by Brandi comprehensively its historical aspect, absolute priority was given to its aesthetic aspect, conditioned of course by its contingent situation. The restoration of works of art was therefore entrusted to artists, who were free to introduce personal methods, often secret or private, consistent with the aim of returning the work to its pristine material state, but not necessarily to its original intended state. “In the evolution of the ‘art’ of restoration, the laboratory for the Restoration of Pictures in the Vatican Museums has had a not insignificant role. Founded in 1992 by Biagio Biagetti according to the latest ideas, and subsequently provided with a Laboratory for Scientific Research, the institute is today directed by by Carlo Pietrangeli who in 1978 established its guidlines in Rules for the restoration of works of art. “In June 1980 this laboratory, constitutionally responsible for the restoration of the pictorial patrimony of the Holy See, qualified and informed by its enormous experience, which goes back more than 50 years and has been constantly renewed both technically and in terms of personnel, undertook the most important task it had yet undertaken in its history, the restoration of the frescoes of Michelangelo in the Sistine Chapel…” ~ Gianluigi Colalucci, “Michelangelo’s Colours Rediscovered”, “The Sistine Chapel – Michelangelo Rediscovered”, London, 1986. “The restoration of Michelangelo’s frescoes in the Sistine Chapel was a venture that shook the very foundations of the art world more than any other single event has managed to do in the last quarter of a century. 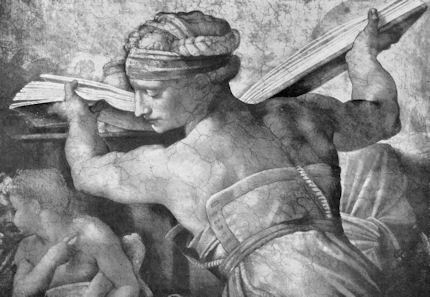 “Promoted and conducted with rigorously conservative objectives, over the course of its execution the restoration program assumed an ever-growing significance in historical and critical terms – an importance that was foretold when the first patches were cleaned and was fully confirmed by the restoration of the Eleazar-Mathan lunette.” ~ Gianluigi Colalucci, “Michelangelo The Vatican Frescoes”, by Pierluigi de Vecchi and Gianluigi Colalucci, 1996. “…The intuition that the colours must have been quite different from those that could be seen can be found sporadically in the writings of the more perceptive scholars of Michelangelo, from [Charles Heath] Wilson to Biagetti and Wilde. But clear and conclusive evidence of the original colours was established for the first time in recent times by the extraordinary photographs of the Japanese photographer Takashi Okamura, taken just before the restoration and published in a book of 1980, unfortunately in a small limited edition and now not widely seen. The eye of the camera, in itself much more acute than the human eye, and aided by much stronger light than is usually available in the Chapel, revealed beneath the dirt and deteriorated glue-varnish the tangible existence of of what the restoration today is gradually retrieving. 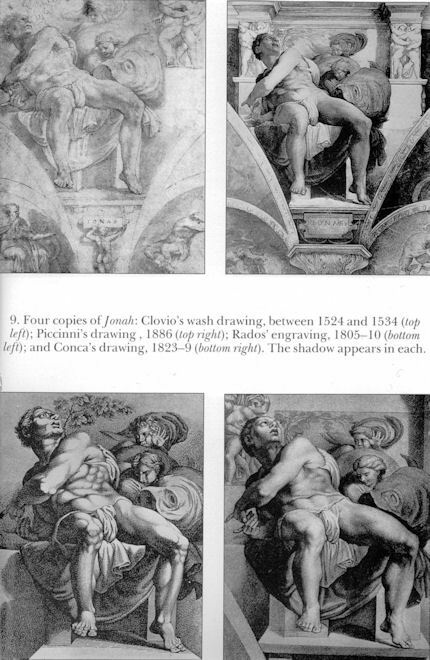 “Although the book with Okamura’s photographs and the restoration that is now proceeding came about independently and for different reasons, the two are complementary, and Okamura’s book is today a valuable record of what for centuries had masked the true nature of Michelangelo’s painting; if the cleaning had not gone ahead, it would have been the sole means by which to achieve a proper or effective analysis of his work…” ~ Fabrizio Mancinelli, “Michelangelo at Work”, “The Sistine Chapel Michelangelo rediscovered”, London, 1986. Above, (top) Fig. 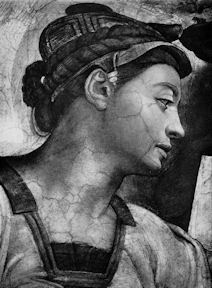 1: Michelangelo’s Libyan Sibyl, detail. Above, Fig. 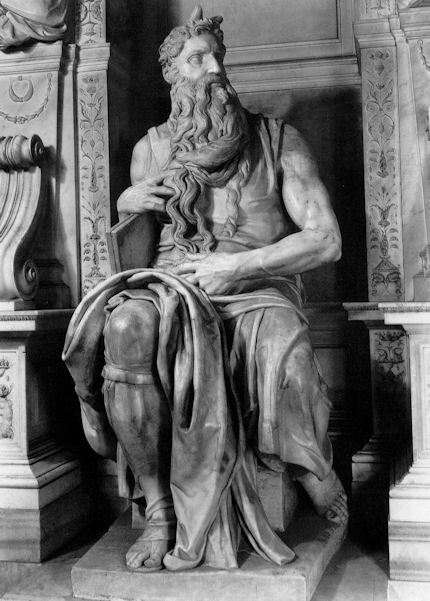 2: Michelangelo’s Moses. Evaluating restorations (or attributions) requires a clear appreciation of an artist’s most secure works and characteristics. 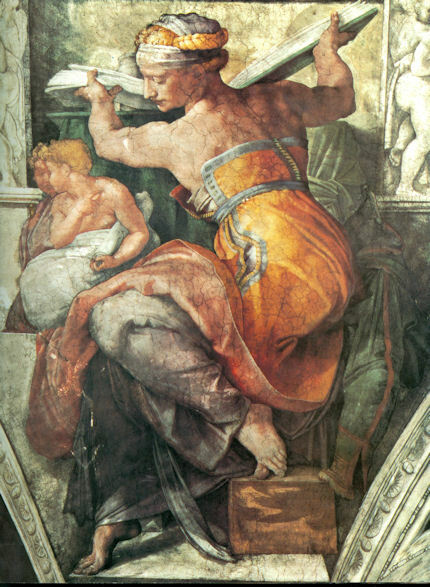 Michelangelo’s phenomenally potent carved figures, such as his Moses (above), found parallel realisation in the figures he was compelled to paint on the Sistine Chapel ceiling, such as the Libyan Sibyl shown at Fig. 1 and below. In the reproduction of his Moses at Fig. 2, we see how (natural or artificial) light and shadows are trapped/made by the architectural projections. Within the constraining rectilinear spaces set by the architecture, the figure’s own component parts move and shift against one another so as to produce planar and volumetric dynamism and expressive anatomical torsion. The not-naturalistic drapery in the Moses complements and enhances the body’s deportment with its own autonomously animated structures and vitalising rhythms. The deeply undercut, shadow-producing drapery over Moses’s left thigh had found direct pictorial anticipations on the ceiling in the Libyan and Erythraean sibyls shown here. Michelangelo had discovered, as Leonardo had taunted, that a painter controls his own lighting and can (like an etcher) submit it to his own singular will, darkening here, highlighting there, shaping and moulding matter with form-describing tonal values and relationships. In Fig. 1, which is a fragment of a coloured painting reproduced in greyscale, we “see” a piece of sculpture – or strictly speaking, a sculpturally conceived figure that happens not have been made but was depicted pictorially with an imagined optimal lighting so as to render its forms with the fullest sculptural lucidity and force. 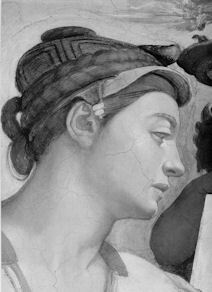 Such was Michelangelo’s genius in these matters that the fragment from his Libyan Sybil might be thought the creative equal of a fragment of the Parthenon’s carved frieze. Above, Figs. 3, 4 and 5. Fig. 3 (above, top) is a fragment of the Libyan Sibyl’s drapery before restoration. Fig. 4 (above, middle) is the same fragment after restoration. Fig. 5 (above) is a fragment of an engraved copy of the Libyan Sibyl made in 1797 by a fine (Flaxmanesque) engraver, Tommaso Piroli. 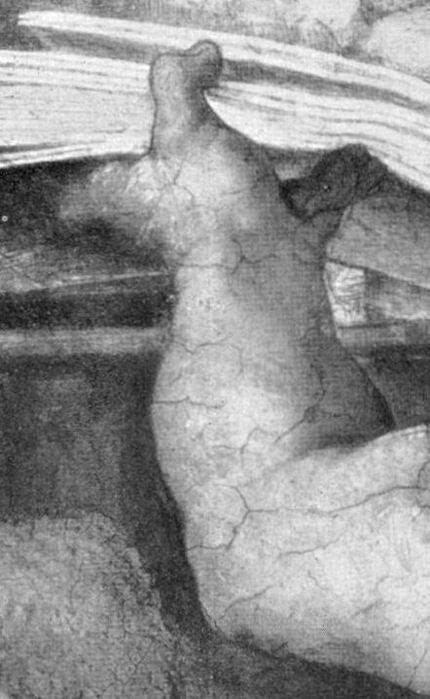 Of the three images, the first is by Michelangelo as found before the last restoration. 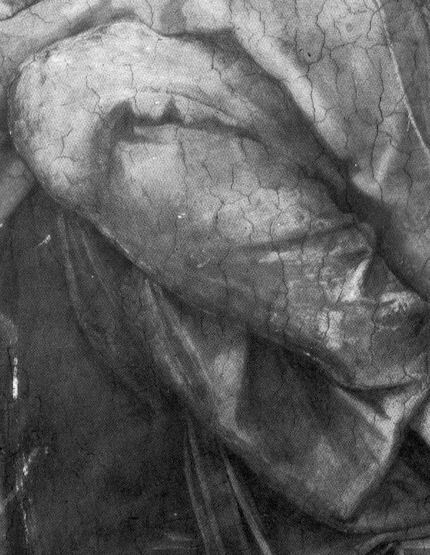 The second is the same fragment of the figure as it emerged after the last restoration. The third is the corresponding fragment of a copy showing the figure as it had survived for nearly three hundred years. We hold that the differences between the first and the second states constitute evidence of injury, and claim support for this reading in the third image here and in the images at Figs. 6, 7 and 8. As further corroboration, we show below how, in the wake of the restorations of the 1980s and 1990s, many similarly injured passages can be found throughout the ceiling. The painting contained in the first image (at Fig. 3) had never been challenged or doubted as part of an entirely autograph work of Michelangelo. Never challenged, that is, until the beginning of the last restoration when the Vatican’s restorers advanced a claim that this figure, and all others on the ceiling, had been so deformed by dirt and successive layers of restorers’ varnishes as to constitute a corrupted and misleading Michelangelo. The true Michelangelo, it was contended, lay unrecognisably different under alien material accretions which, with the help of some very powerful chemicals-in-a-gel, would be dispersed – even though the resulting change of appearance in the paintings would in turn require that everything previously thought about the artist be overturned. Tragically, the Vatican authorities permitted this hubristic, artistically perverse and historically unsupported programme to proceed. That which had survived for nearly five hundred years in Fig. 1, was turned after two three minutes long chemical dousings into Fig. 2. The pre-restored image showed drapery that was boldy massed, purposefully shaded and satisfyingly sculptural in its volumetric descriptions and compositional fluency. To educated eyes, its then appearance could only have been a product of artistry. It could not have been an accidental by-product of random accumulations of unequally disfigured accretions, as has been claimed in defence of all the restoration changes. The pre-restoration state, as is shown above, bore too close a family relation to Michelangelo’s carved sculptural forms for its authorship ever to have been in question. By comparison, the post-restoration image is weaker; its forms smaller; its tones consistently lighter. The surviving tonal modelling is more local to each piece of material, less broadly unified across incidents. It is thus weakening to the previously strong overall sculptural effects, spatially ambiguous, and more akin to shallow relief than free-standing sculpture. There is no historical corroboration for today’s appearance – it appears in no copies. All of which raises the question: “Why was the very design of Michelangelo’s work changed by this removal of a piece of drapery?”. The large fold of drapery that hangs from the lower left leg no longer sweeps down gracefully from below the knee, as seen if Figs. 3 and 5, but emerges abruptly and uncomfortably at the shin. On stylistic grounds alone, the removed material cannot be said to have been an addition made by some other person, let alone by accretions. This section of pre-restoration drapery was entirely, seamlessly of a piece, and served a clear compositional purpose. Above, Fig. 6. 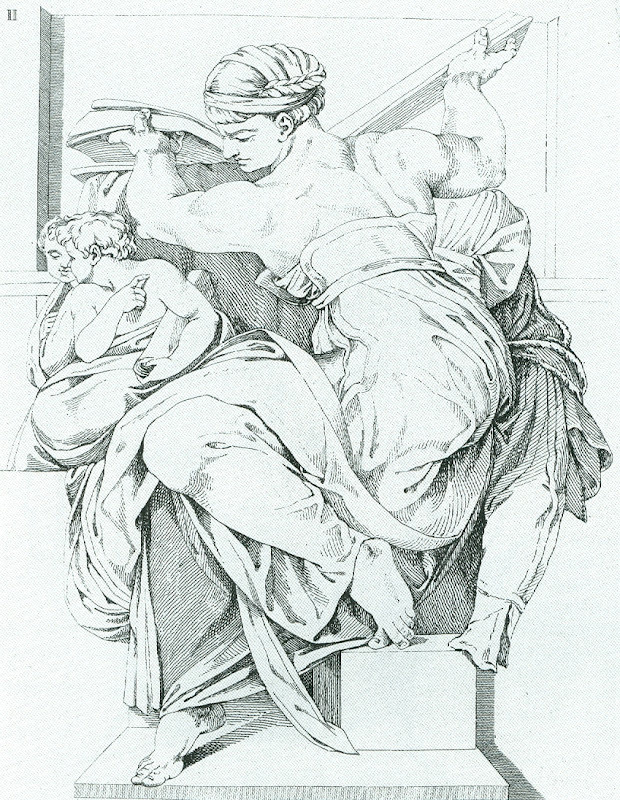 The Libyan Sibyl, as copied in 1797 by Tommaso Piroli. As well as giving the clearest account of the not-yet truncated drapery hanging from the left leg, Piroli (an engraver of antiquities) provides an elegant shorthand account of Michelangelo’s three principal zones of dark tone. The first, at the bottom between the legs, differentiates their positions in space vis-a-vis the viewer: the side of the more distant leg misses the strong light source (as indicated by its emphatically cast shadow) and is therefore optically subordinated by darkened tones. The arms and torso are relieved by dark tone over the drapery hanging from the table. The curving sweep of drapery on the right begins brightly at the top, as if caught by the light. This area of brightness relieves the darker shaded side of the arms and torso. It then darkens as it passes close to the Sibyl’s body before lightening again as it moves froward into the light that catches the left leg and foot. Above, Figs 7 and 8: Two states of an anonymous 16th-century engraving. Although the author of this copy (published in “La Sistina Riprododotta”, 1991, and here reversed) was not as fluent a draughtsman as Piroli, and took liberties with the architecture, on the two crucial issues of the right foot’s cast shadow and the shape and the extent of the hanging drapery at the raised left leg, the copy is entirely consistent with the later artist’s testimony. Thus, just as with Piroli two centuries later, we see that the drapery emerged below the knee and at an acute angle. It did not, as today, burst into view abruptly at a right angle from behind the shin, as left by the restorers. 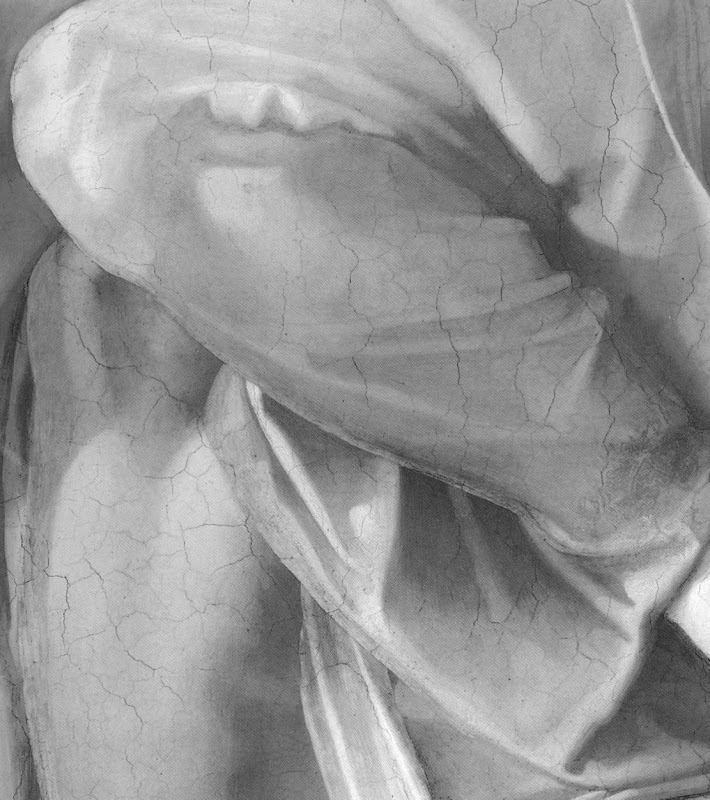 We can rule out the possibility that a change might have been made to Michelangelo’s drapery by a restorer even before this 16th-century engraving was made. The restorer known to have been called in during the 16th-century – Domenico Carnevale – did so in 1566. He made five repairs in total and all were made in buon fresco, not a secco. He did no work on the Libyan Sibyl. 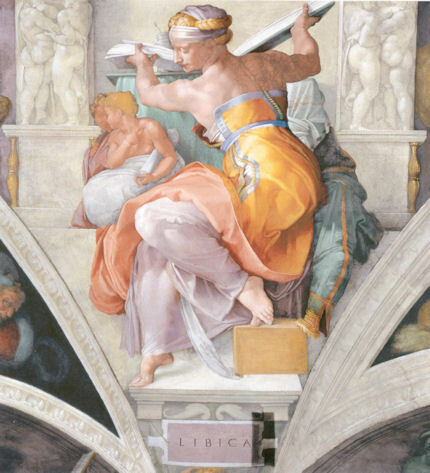 Thus, only Michelangelo could have amended his own buon fresco work on the Libyan Sibyl’s drapery with a secco painting – just as he can be seen to have done on the sybil’s right foot…which can also be seen to have been injured in the last restoration, at Figs. 11, 12 and 13. Above, Figs. 9 and 10. The legs of the Libyan Sibyl, as published in 1990 (left) and in the post-restoration state in 1992 (right). In Fig. 9 we see how before restoration the former design of the hanging drapery helped create a compositionally mediating, “fanning” movement between the position of the two legs, as had been recorded in the 16th and 18th-century copies shown above. 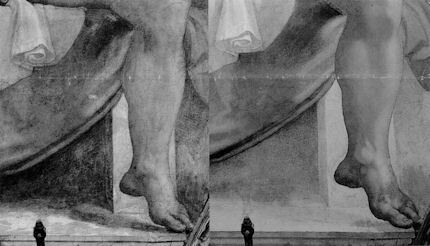 Both copies show that, as before restoration, the wedge-shaped piece of hanging drapery ran into the shadowed zone that served to push back the right leg and give greater prominence the left leg. This sequence records many alterations made in the Libyan Sybil’s right foot: before cleaning (top); after cleaning (middle); and after repainting (bottom). In fig. 11 we see a mini fanning movement in the three short dark accented folds at the ankle of the sybil’s right foot which have melted away in Fig. 12. We see also in Fig. 11 examples of what Alexander Eliot described as “Michelangelo’s loving depiction of fingernails, eyelids and tiny wrinkles”. Once again, Michelangelo’s habit of placing a dark shadow beind the lit edge of a form and a light ground behind its shaded side was evident here in his treatment of the strategically dramatic arched foot. This sequence also comprises a tacit acknowlegement of error on the part of the restorers. Evidence is here present not just of the loss of the foot’s cast shadow (as also with the Jonah below) but even of its anatomical credibility. 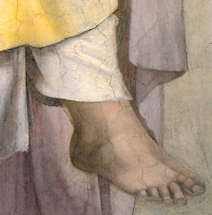 Michelangelo had repositioned this foot, scraping away one part and adding another. 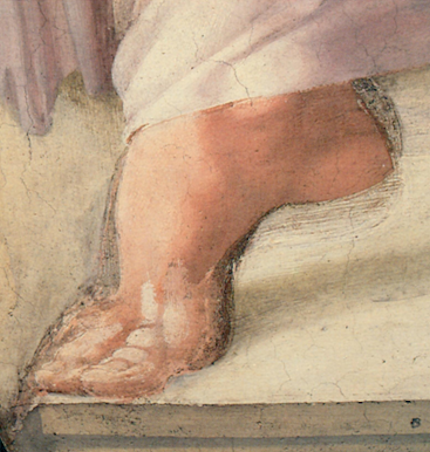 The cleaning undid this revision, and thereby produced (uniquely in Michelangelo’s oeuvre) a human heel that was not rounded but that came to a point, as in Fig. 12. 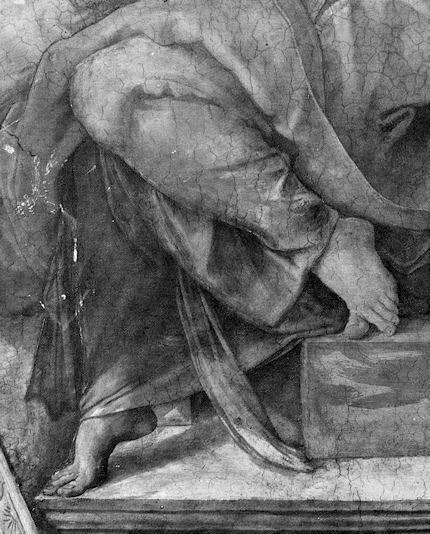 We questioned this transformation (and that of the Erythraean Sibyl’s right foot, shown below) to Fabrizio Mancinelli, the co-director of the restoration, when he gave a talk on the restoration at the Courtauld Institute, London. Later, on visiting the Chapel we discovered that the heel had become rounded again if not entirely whole, as seen at Fig. 13. Clearly, if the repainted addition is now correct, it should never have been removed in the first place. Above, Fig. 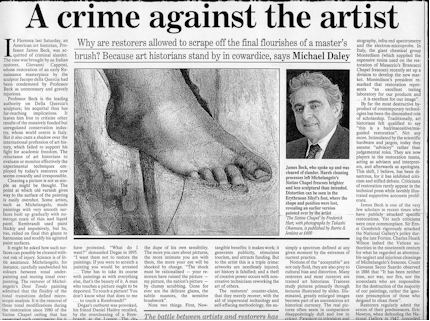 14: An article in The Independent of 22 November 1991, which first showed the Erythraean Sibyl’s right foot as it emerged after restoration. Above, Figs. 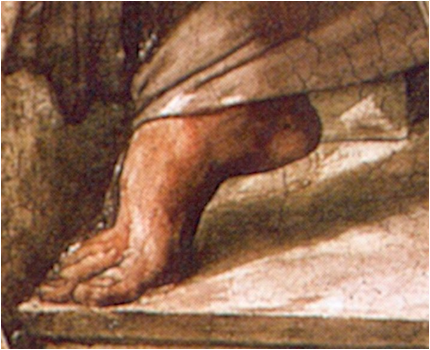 15 and 16: The Erythraean Sibyl’s right foot before cleaning (left) and after cleaning and restoration (right). Note, in addition to the mangled foot, the changes made to the forms and the colours of the drapery. 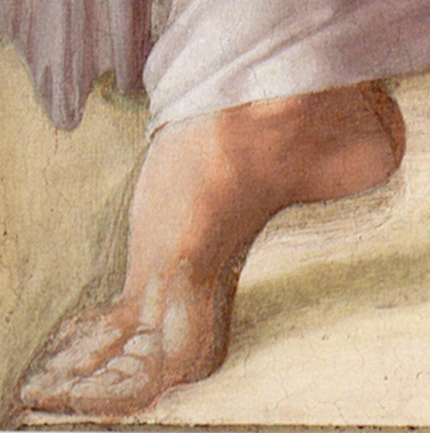 We assume that no one believes that the foot today is as Michelangelo intended it to be left. We have found deafening the collective silence of art historians and art critics on this grotesque blunder. Perhaps some think that such sacrifices of authentic painting are a price worth paying to get at brighter colours? Note how effectively Michelangelo had simulated monumental figures set within palpable architecturally bounded spaces. On the left, we see the Libyan Sibyl (discussed further below) and the Prophet Daniel. Note particularly with what force the drapery over Daniel’s right shoulder cascades and twists, and how emphatically it captures a deep dark shadow next to his right side. Above, Figs. 18 and 19: The Prophet Daniel, before restoration (left) and after restoration (right). In this pairing, we see one of most massive destructions of a Michelangelo a secco revision. Once again, corroboration of the pre-restoration state – and disqualification of the post-restoration state – is found in early copies of the figure, as shown below. Above, Figs. 20 and 21. 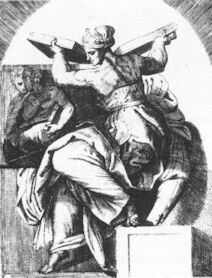 Engraved copies of the Prophet Daniel. 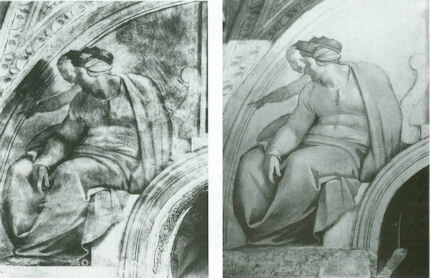 These two copies made in the 1790s by artists working in very different graphic styles (in tones in the case of Giovanni Volpato, left, and with lines with Tommaso Piroli, right) both testify to the then survival of Michelangelo’s unprecedented pictorial chiaroscuro – his emphatic placement of lights against darks which had so struck and thrilled his contemporaries. The operative words were “now that it has been cleaned”. 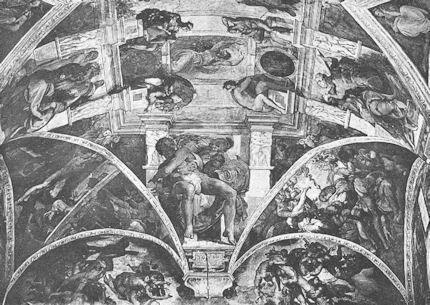 While it is true that Michelangelo’s biographers had suffered the handicap of having to respond to the ceiling when it was freshly painted and not yet “cleaned”, it was remiss of Penny not to have noticed that none of Michelangelo’s contemporaries had spoken of dazzling colours or likened his great fresco cycle to 15th-century panel paintings. 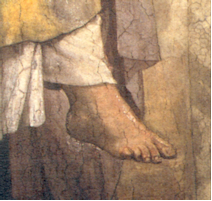 The truth is that Michelangelo had shown his figures and his fictive architecture as if placed in a brilliant “cinematographer’s” light – why else, how else, could so many of his feet have originally sported such dramatically cast shadows on the ceiling’s illusionistic mini projected “floors”, and so many of his figures have cast such dramatic shadows onto the walls? Above, Figs. 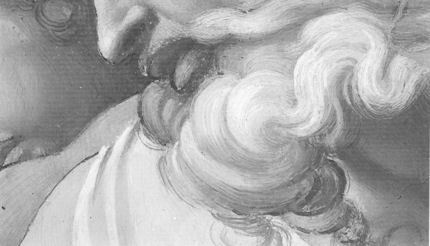 22 and 23: God (detail) in Michelangelo’s panel showing the bestowing of life upon Adam, before cleaning (top), after cleaning (above). If old pictures were simply being cleaned and not injured, their ranges of tonal values would be extended and not diminished, as seen here. For example, in the bottom left-hand corner what was graduated, nuanced, modelled, has become uniform, flatter, more “on the surface”. The ridges of drapery which formerly wrapped round the shoulder, now break off short. The folds themselves have become simpler in drawing, less expressive in shading. Lines of under-drawing emerge more strongly, while crisp tonal demarcations blur. Individual hairs get lost. If Michelangelo really had left his painting as in this “cleaned” state, what might have improved the drawing and modelling to the degree seen in the uncleaned state through all the (alleged) foreign accretions and filth? Above, Fig. 24. This pre-restoration photograph shows the crucial junction between the Last Judgement and the ceiling. The zone contains some of Michelangelo’s most brilliant figural inventions, of which the commanding central Jonah earned the greatest admiration when the ceiling was unveiled. 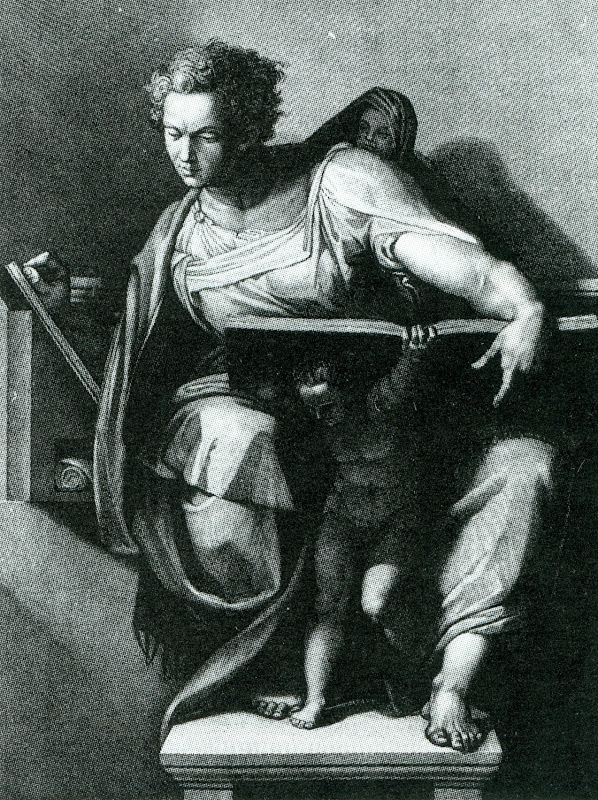 Note the general dispositions of tonality, the relative lightness of the illusionistic compartmentalising architectural elements, and the then legibility of the shadow cast by Jonah’s left foot – which foot, curiously, touches the same architectural arch as the foot of the Libyan Sibyl, above and to the right of Jonah. Above, Fig. 25: Jonah’s left foot, before cleaning (left), and after cleaning (right). While no one enthused over Michelangelo’s colours, everyone marvelled at his unprecedented use of light and shade on the ceiling. Among them, Condivi thought the Jonah the “most admirable of all…because contrary to the curve of the vault and owing to the play of light and shadow, the torso which is foreshortened backward is in the part nearest the eye, and the legs which project forward are in the part which is farthest.” Vasari asked: “Then who is not filled with admiration and amazement at the awesome sight of Jonah…The vaulting naturally springs forward, following the curve of the masonry; but through the force of art it is apparently straightened out by the figure of Jonah, which bends in the opposite direction; and vanquished by the art of design, with its lights and its shades, the ceiling even appears to recede.” [Emphases added.] Note carefully what was being said at the time: by his drawing and his use of lights and darks, Michelangelo had made surfaces which were actually advancing towards the viewer seem to recede. What was not said, pace Mancinelli, was that Michelangelo’s colours had been used “pure” and that, as such, they had played “a primary structural role”. No authority then existed for the restorers’ recent trading of those impeccably accredited lights and darks for today’s heightened colours. Above, Fig. 26. Four copies of Jonah, as published in “Art Restoration: The Culture, the Business and the Scandal” in 1993. Most certainly, no authority existed for removing the shadow cast by Jonah’s foot. Countless copies over the centuries had recorded it. 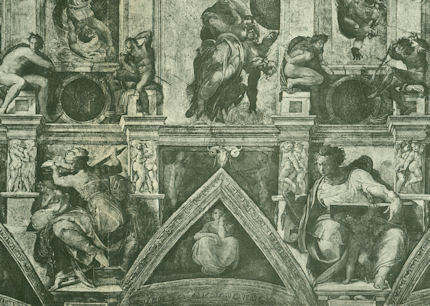 Giulio Clovio, in his copy shown here in the top left-hand corner, also recorded (in the bottom corners) parts of two lunettes that Michelangelo had painted before 1512 but destroyed before 1536 to prepare a continuous surface for the Last Judgement. Above, Fig. 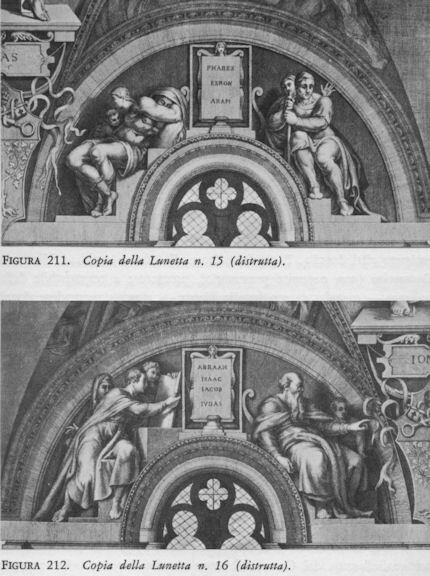 28: A lunette figure before (left) and after (right) restoration. This was one of three photo-comparisons of the cleaned lunettes published by the sculptor Venanzo Crocetti in the December 1989 Oggi e Domani. That there was much surface disfigurement on the lunettes is not in dispute. Crocetti had seen for himself after years on the scaffolds that the effects of smoke varied by location within the Chapel and that the lunettes had been disproportionately affected because of their position at the junctions between the walls and ceiling. The central question in the restoration generally, as here, is why previously evident artistic features (shadows, folds of drapery and so forth) disappeared along with the dirt through which they had formerly been visible? How, for example, could the left thigh of this figure have been perceived before restoration with a light upper surface and a darker side surface – and why did that tonal distinction disappear? Above, Fig. 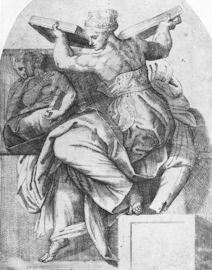 29: An engraved copy of Michelangelo’s Erythraean Sibyl made in the 1570s by Giorgio Ghisi. Here we see that shadows that disappeared in the last cleaning had been recorded within sixty years of the painting and therefore could not have been products of later accretions. It has sometimes been suggested that the testimony of engraved copies is not reliable because engravers exagerated tonal effects. Ghisi produced five other major plates of the prophets and sibyls (and of their surrounding figures). Like his Erythraean Sybil above, all showed a strongly dramatic use of shading that was still to be found in the figures themselves until the restoration. If Ghisi had exaggerated, what had he been exaggerating at a time when soot and restorers’ alleged varnishes had yet to impart their (Mancinelli-attributed) chiaroscuro-esque effects? Had Ghisi and other early copyists like Giulio Clovio collectively anticipated dramatic effects that Time and Accident would bestow centuries later? Above, Fig. 30: The Erythraean Sibyl before cleaning. Note the many correspondences of lighting and shading between the engraving and the photograph four centuries later. In both, the Sybil’s head casts a shadow onto the architecture. In both, the face’s lit profile is thrown into relief by background shadow. In both, the deeply undercut ‘U’ shaped fold of drapery that runs from the right thigh begins in the light but sinks progressively into a shadow which merges with the shadow that the figure casts onto the architecture. Above, Figs. 31 and 32. 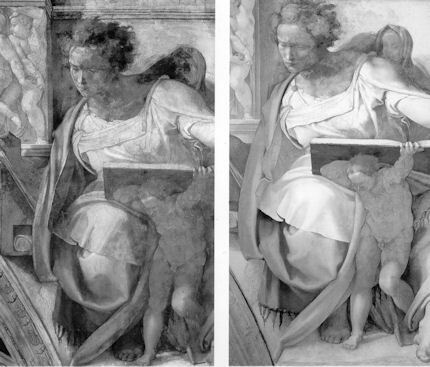 The head of the Erythraean Sibyl before cleaning (left), and after cleaning (right), showing catastrophic losses of modelling and shading. Note here the particulary emphatic and successful use of the tonal convention of relieving light contours against dark grounds, and vice versa, so as to deploy the most sculpturally expressive range of half-tones in between. Above, Fig. 33: This (rotated) view of the ceiling in which the vertical wall appears in the bottom left corner shows the complicated curved geometries on which Michelangelo’s images were painted and the curious way in which the shadow-casting feet of Jonah and the Libyan Sibyl touch the same piece of curving architectural moulding. Michelangelo’s task in designing and executing such a complex array of figures in so precise an “architectural” context was immensely difficult. In this respect, it would be less than human not to feel some sympathy for the restorers whose handicaps were compounded by the decision to allow the sponsors (the Nippon Television Corporation) to film the entire operation from the scaffold. In addition to the TV crews, other photography was permitted as part of the restoration’s promotion in the media. In one specialised respect, photographs that catch restorers at work can illuminate restoration proceedures to a degree rarely encountered in offical presentations. Above, Fig. 34: The Libyan Sibyl during cleaning. 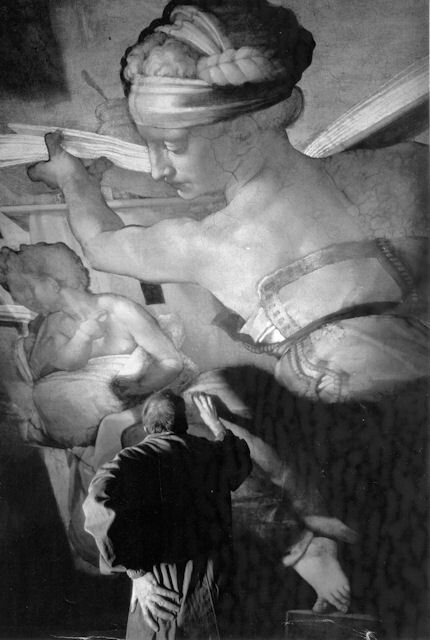 This photograph, of a restorer being filmed at close quarters while working on the Libyan Sibyl, was reproduced across two pages of a 1992 book “Michelangelo and the Creation of the Sistine Chapel” by Robin Richmond, a painter who was supportive of the restoration. It shows that the figures were being cleaned first and separately from the backgrounds. A slight overlapping of the cleaning onto the figures’ dark green “relieving” background has introduced a light green halo-effect. The difference between the light green ‘halo’ and the adjacent dark green between the figures indicates the magnitude of the reductions of tonal values that took place in the shaded zones throughout the cleaning. As Crocetti had observed, Michelangelo had used his size or glue painting most of all in these zones. Wilson, testified that he had done so with a finely ground black pigment. Above, Fig. 35: The Libyan Sibyl during cleaning. Over the years, many excellent photographic records of major restorations have appeared in National Geographic. 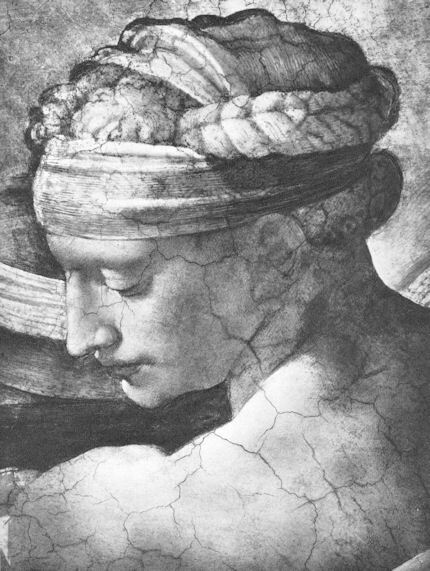 The December 1989 issue carried an article (“A Renaissance for Michelangelo”) which contained the stunning photograph above by Adam Woolfit (here in greyscale for comparative purposes). This photograph records the cleaning as it approached the draperies over the Libyan Sibyl’s legs. The halo effect seen at Fig. 25 had by then disappeared along with the removal of almost all of the dark green background toning. 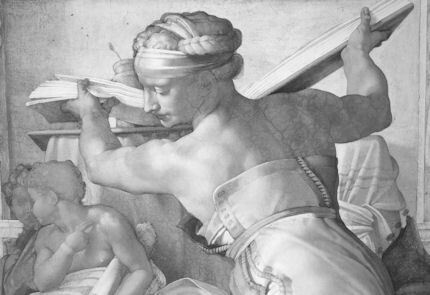 Only a small rectangle of the former dark paint on the background remained, temporarily attached to the bottom of the Sibyl’s left upper arm. Woolfit eloquently captures the extremely bright artificial television lighting under which the restorers worked, and, most valuably of all, an “in-between” state when the incoherences that emerge in the stripping-down of paintings have yet to receive restorers’ tidying and patching-up with the paint brush (-or, in restoration trade posh, “reintegration”) . Above, Fig. 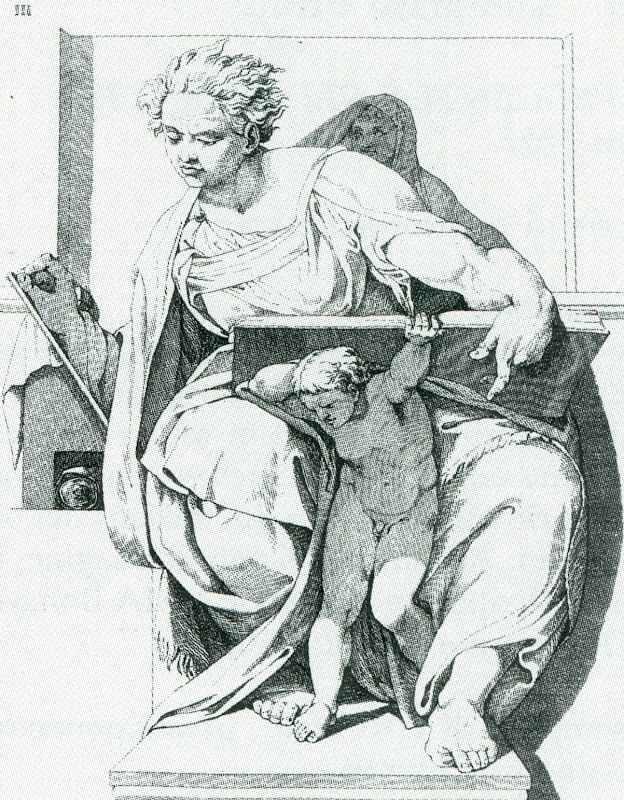 36: The Libyan Sibyl as published in 1990. Above, Fig. 37: The Libyan Sibyl as published in 2010. The transformation during restoration was immense. In 1986 Mancinelli claimed that Michelangelo had used his colours “constantly pure” and that they had served “a primary structural role” enabling him to “abandon almost altogether traditional chiaroscuri modelling”. The following photographs chronicle the swift demise of Michelangelo’s nearly five hundred years old chiaroscuri. Above (top), Fig. 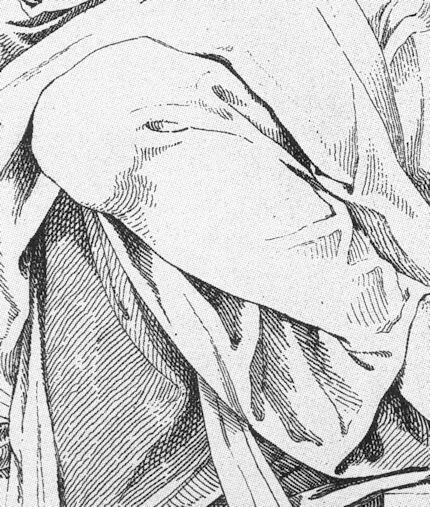 38, the torso of the Libyan Sibyl, as published in 1904 and, Fig. 39, in 1996. Within the characteristically restoration-compressed range of tones, the boy’s hair, which previously was light and blonde, relieved against a blackish green ground (as seen in Figs. 36 and 38), is now darker than the radically “cleaned” light green background drapery. If we consider the whole figure before cleaning (as at Figs. 17, 33 and 36) we see a consistent and dramatic light falling on it from the left. As well as casting the strong shadow from the right foot, that light illuminated the left side of the sibyl and the right-hand side of the architecture. The sibyl’s head had a lit side and shadowed side and, just like that of the Erythraean Sybil, each side was set off by a tonally contrasted background. Similarly, the brightly lit left arm was strongly relieved by the very dark green drapery, while the shaded right arm was thrown into relief against the light stonework…and so forth. After a cleaning, we would expect Fig. 39 to be like Fig. 38 in its values only more so with lighter lights and darker darks. Instead, while Fig. 39 is now certainly cleaner looking and tidier, by comparison with its former self, it resembles an early state of an etching before the dark tones and blacks have been worked up – rather as may be seen at Figs. 7 and 8. Above, Fig. 40. The Libyan Sibyl’s head, as published in 1966, before restoration. Note the progressions of tones, and the brilliant highlight at the shoulder. Above, Fig. 41: The testimony of Woolfit’s 1989 photograph (detail) of the cleaning in progress. We see at this stage of restoration that along with the removal of the glue-based paint on the background green draperies, the formerly clear and precisely established contours of the left upper arm have been disrupted by the emergence of dark patches of sketchy, inconsistent and disconnected outlining. Given that these arbitrary irregularities are not present in either the pre- or the post-cleaning states, we must consider how they arrived and how they were persuaded to depart. Above, (top) Fig. 42, the Sibyl’s forearm, as seen in 1904. Above, (middle) Fig. 43, the Sibyl’s forearm, as seen during cleaning in 1989. Above, Fig. 44, the Sibyl’s forearm as seen after cleaning and repainting. At Fig. 43, once again, along with the removal of the former dark toning material behind the arm, we see remarkable changes to the tonal modelling of the arm itself and to its previously lucid, now erratic contours. We would claim that such changes cannot be seen as anything other than restoration-induced injuries: 1) It is inconceivable that Michelangelo would ever have been content to leave a limb in such a condition. (Think of the Virgin’s arms in the Doni Tondo.) The massively intrusive overdrawing of the thick bar-like contour of the thumb and forefinger seen after cleaning at Fig. 43 is inexplicable except as preliminary underpainting. (Remember that Crocetti complained of AB 57 having penetrated the frescoes to a depth of half centimetre.) 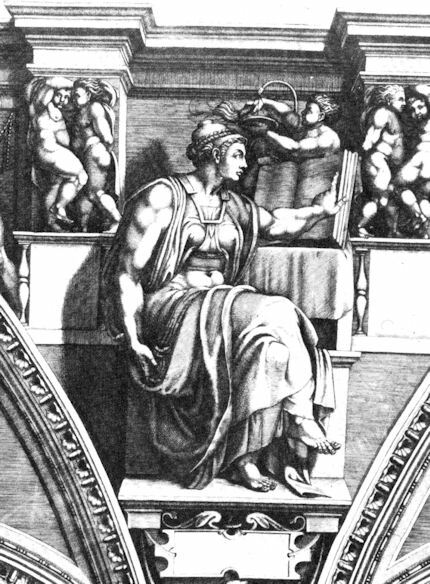 2) It is inconceivable that Michelangelo would have depicted the left contour of the forearm being ruptured by the intrusion of the edge of the giant book’s cover board that rests on the top of the draped table behind the sibyl, as seen at Fig. 43 (and as such, exclusively by courtesy of Woolfit’s photograph, so far as we know). Such an illogical intersecting relationship might have appealed to Picasso in his analytical cubist phase, but it could hardly have done so to Michelangelo. How, then, did it arise and how did it disappear? Have any accounts been published of the emergence and swift extinguishing of this extraordinary pictorial phenomenon? Has film of the cleaning of this arm been broadcast? 3) Finally, it is of course, inconceivable that had Michelangelo left the forearm drawn and modelled as seen in 1989 at Fig. 43, that subsequent accumulations of soot and glues could have sufficiently remedied his defects of drawing so as to bring the work to the condition seen in 1904 at Fig. 42. Clearly, the restorers themselves did not accept the emerging injuries to the arm to be a fair recovery of some original and authentic condition, because it is apparent from Fig. 44 that steps were taken to paint out some of the more glaringly incongrous defects. But who was the author of the “corrections” to the very defects that the restoration unleashed? Who should be accredited for authorship of the hybrid, revised arm as seen at Fig. 44? Above, Fig. 45. In December 1989 National Geographic published this beautifully balanced record (here flipped) by Victor R. Boswell, Jr. of the last moments of the Sistine Chapel ceiling as finished by Michelangelo. 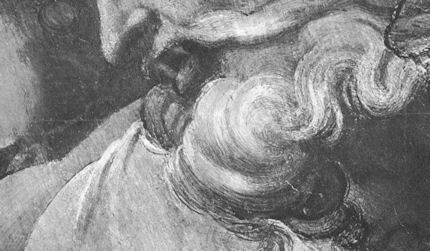 Springing from the centre top of the not-yet-cleaned Last Judgement we see Jonah around whom congregate, in the last section of the ceiling that Michelangelo painted, some of the artist’s most miraculously inventive figures set in their fictive temple-in-the-sky. For a little longer this section retained the majesty and mystery of the infinite space and dark depths that had survived for nearly half a millennium. This entry was posted on February 1, 2013. It was filed under blog and was tagged with AB 57, Alexander Eliot, Anderson photographs, Antonio Paolucci, Art Restoration The Culture, Ascanio Condivi, B 72, Barium Hydroxide, Carlo Pietrangeli, Carrier-Delchi, Charles Heath Wilson, Christoph Frommel, Conservation Ethics, Conservation science, EDTA, Fabrizio Mancinelli, Gianluigi Colalucci, Giorgio Vasari, Istituto Centrale de Restauro, J A Rivington, jane winslow eliot, Kathleen Weil Garris Brandt, Laura Mora, M Kirby Talley Jr., Mauro Pelliccioli, Michael Daley, Michelangelo's Erythraean Sibyl, Michelangelo's l'ultima mano, Michelangelo's Libyan Sibyl, Michelangelo's Moses, Mirella Simonetti, Nazzereno Gabrielli, Nicholas Penny, Nippon Television Corporation, Paolo Mora, Prof Camuffo, Prof. James Beck, Robin Richmond, Synthetic Resins, The New Michelangelo, The Sistine Chapel, The Sistine Chapel Ceiling, The Sistine Chapel restoration, The Vatican Museums, The Wethersfield Conference, Toti Scialogia, Venanzo Crocetti, Walter Persegati.